Last week I was invited by Sociolla Beauty Journal and Veet Indonesia to attend their "pink theme"event at William's. The event was titled: "Mastering Hollywood & Korean Brows with Veet Indonesia", and there are special guest stars such as the famous beauty blogger Rachel Goddard, the actress Julie Estelle, and the well-known makeup artist Ryan Ogilvy. All big names there! And the atmosphere was also very nice and pretty and cutesy at the same time with everyone wearing pink as the dress code of the event. 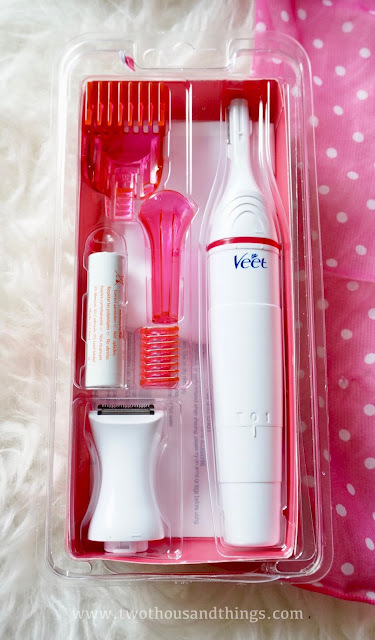 During the event we were introduced to the new Veet Sensitive Touch Electric Trimmer, a beauty tool which can help us easily trim and shape our brows and achieve the precise look we always wished for. With this new device specially designed for women we can also quickly and gently cuts and shapes our sensitive and delicate body areas such as underarms, bikini line, and facial hair with ease. 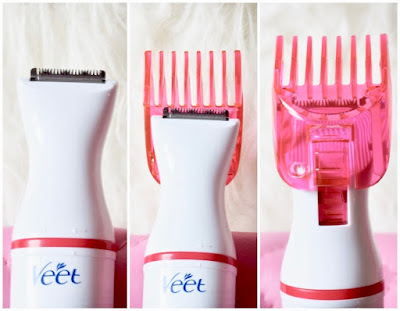 I am actually quite excited with this new beauty trimmer from Veet. It is specially designed for women's needs (but boys can use it too 😉). I think this device is perfect for both newbies and those with experience on trimming and shaping eyebrows. 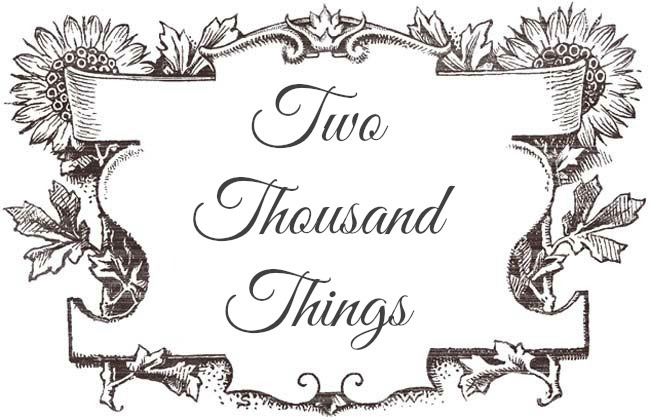 It is also great for other body parts too (read more below). Usually, most women would use that dreaded eyebrow shaper with very sharp blades that can cause nicks and cuts on your skin if you're not careful. We also usually shave our underarms area with that regular razor blade from the supermarket, right?. Well I don't know about you but I always have fears of cutting myself if I'm using razor blades and I never master the art of using brow shaper with those really sharp blades because I'm just too afraid to use it. 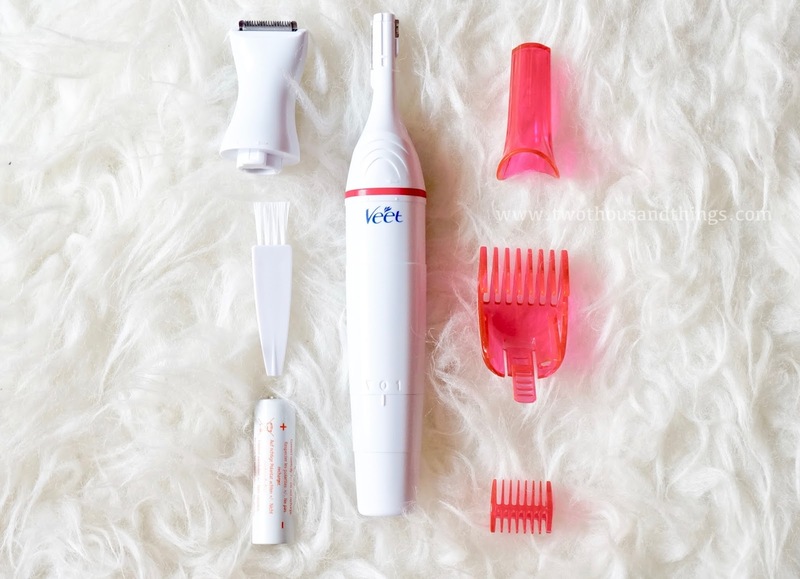 BUT now thank you to Veet who has created this trimmer especially made for women! This trimmer tool is quick & gentle, yet has high precision. So you can easily remove any unwanted hair in one go without the fear of getting cuts. The high precision system also allows you to get precise shaping and styling for your brows. So the above picture is what the electric trimmer looks like in its package set. Right now they only sell it in package form like above. The set came with 6 different tools + one pouch + one battery. So you could use the trimmer immediately after you bought it. It's really nice though, because we don't have to buy separate battery with our purchase. We can use it right from the box. 1. Dual sided trimming head with 6mm & 16mm blades for optimal eyebrow shaping. 2. Dual sided comb attachment (2mm & 4mm) to help uniform hair length. 3. Styler Cap to protect the trimming head when not in use. 4. Larger trimming head (20mm) for other body parts such as underarms and/or bikini lines. 5. Larger comb attachment to help uniform hair length in other body parts such as underarms & bikini line. 6. 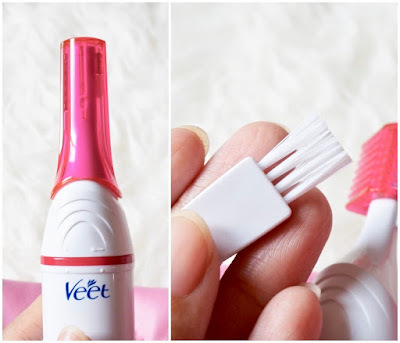 Small Cleaning Brush to dust away hairs left on the blades or combs. + Lastly, you will have a white plain pouch for easy storage. + And also the battery. 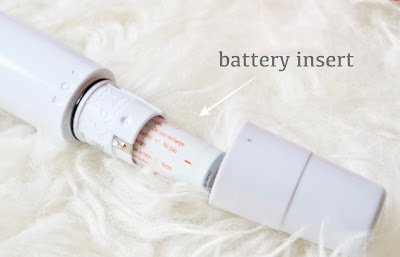 The battery is to be inserted at the bottom of the main device. You can also easily change the trimming heads with just a simple turn at the top of the main device. The two sided trimming head with its 6mm & 16mm blades are meant for eyebrows and other facial hair. If you have smaller / thinner eyebrows you can use the 6mm side (this is what I used), and for those of you who has wider thicker brows you can opt for the 16mm side. 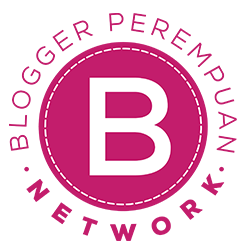 For my brows I firstly use the pink small comb (attached to the trimming head) to trim the flyaway strays on my brows, and then I removed the comb and only use the blade to shape the edges of my brows. I use the 6mm side for the bottom part of my eyebrow and use the 16mm side for the upper part of my brow edges. 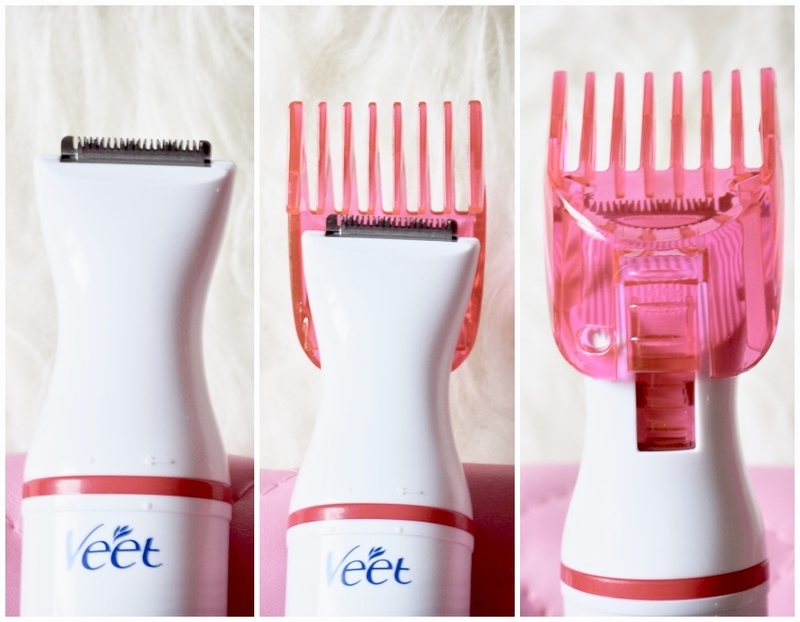 The larger trimming head and larger comb are meant to be used in larger body parts such as underarm and bikini line. To shave my underarm area I only use the trimming head without the comb. The combs are only used for trimming, and I don't want to trim my underarm I want to shave them clean, therefore I only use the blade without the comb. 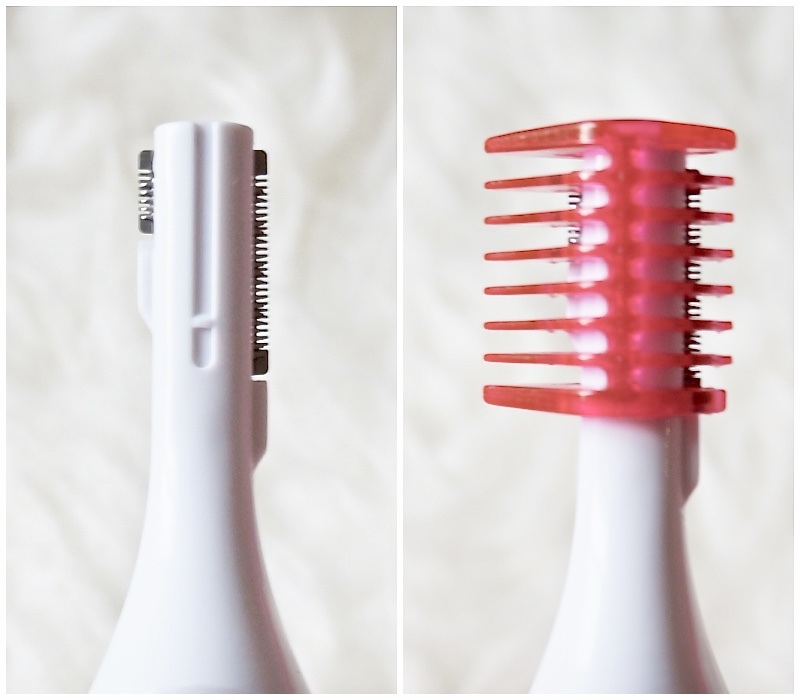 The comb can be use to trim bikini line so you will have uniformed length of hair (😉). I used to hate shaving my underarm area but with this new tool I can finally feel good about it. I don't think it can be used for shaving legs though, but I haven't tried it myself. 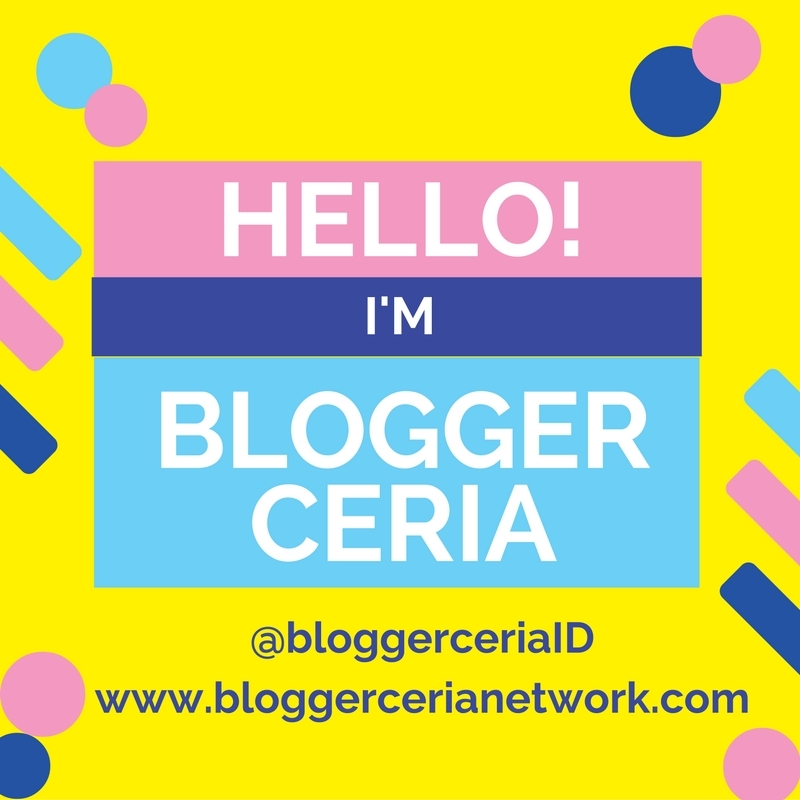 - Use it on DRY skin. - Use it by moving it against the direction of hair growth (dipakai melawan arah tumbuhnya rambut). 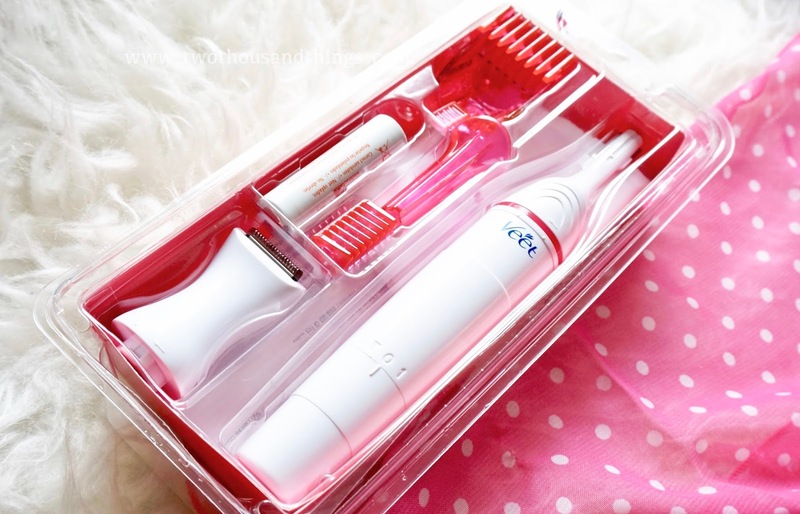 - The main device is NOT washable but the trimming heads are washable (MUST see the instruction card first before you do this!). I've used this electric trimmer a couple times already, both for trimming my eyebrows and also shaving my underarm area. 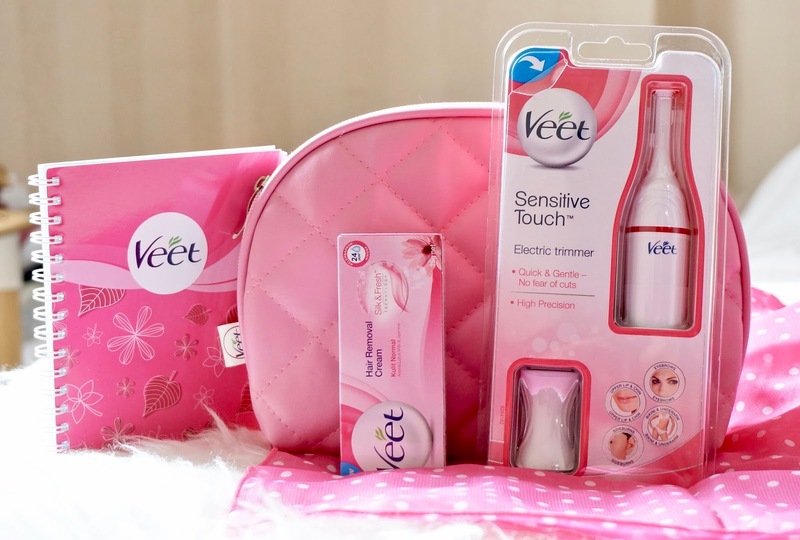 It is so easy to use and glides on easily too without any harsh feeling on skin. I'd say it is very comfortable and easy to handle, and you don't have to worry about getting cuts. 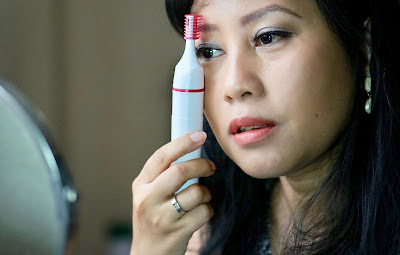 Using this device for trimming flyaway strays on eyebrows is very easy anyone can do it, but for Shaping your brows with the blade it would need a little bit practice first until you get used to it. But once you do, it'll be easy too. 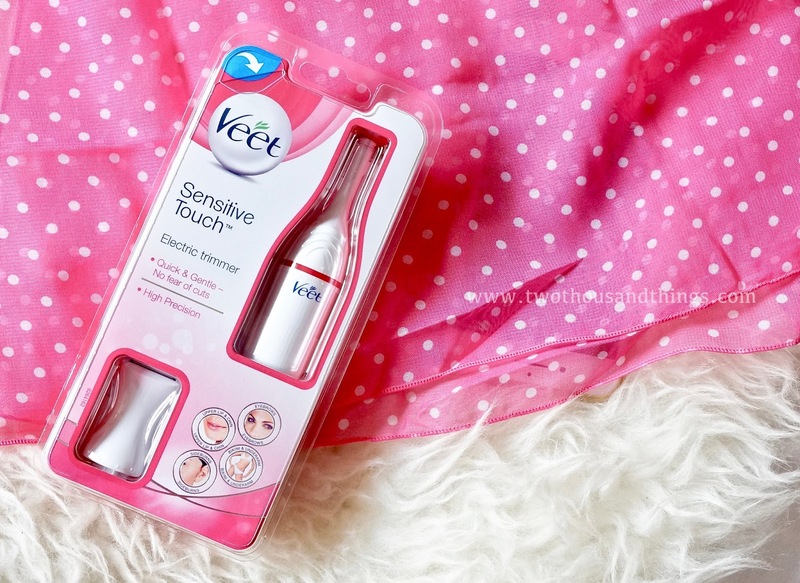 PS: This Veet Sensitive Touch Electric Trimmer can be purchased from Watsons and E-Commerce shops. The price is IDR 390,000 - 450,000. Lemme know if you tried it !